The experience of loving and being loved by man’s best friend is joyous, brilliant and rewarding. 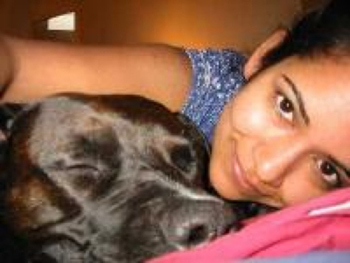 Jyo Buyyala learned that – along with the particular delight of choosing a pit bull dog as her new best friend in 2002. That’s when she visited her local shelter looking for a Shepherd, a Golden Retriever, or maybe a Labrador. Unexpectedly, she made eye contact with a big, beautiful, darkly brindled pit bull dog named Savannah. You can probably guess what happened next. Savannah was all head, and yet all muscle and all heart, with a powerfully thumping tail. Jyo found herself constantly taken aback by the fear, hostility and disapproval Savannah received from both friends and strangers. Time after time, second-hand opinion seemed to trump first-hand experience. One day, Jyo’s mother, who was visiting from India, took Savannah on a walk. The two of them together, with her mother in traditional Indian attire and effortlessly and impressively managing a big exuberant dog, struck Jyo as yet another unexpected sight. It warmed her heart to know that one of the reasons Savannah was so well behaved was her love of her grandma’s chicken curry. She was piling up so many unexpected pit bull moments in her memory banks, and Jyo was inspired to create The Unexpected Pit Bull Calendar. Her vision: To boldly, proudly, unexpectedly showcase true stories of pit bull type dogs sharing their lives with loving families, and, in doing so, to reveal to the world the beauty, comedy, softness, exuberance, friendship, loyalty and courage of pit bulls. Since 2004, new calendar editions have been published each and every year as true labor of love. Developed by a small group of volunteers, they have been warmly received by thousands all over the world. The eighth edition for 2012 comes with a stunning new design and breath-taking photography shot by HeARTs Speak member photographers. As always, The Unexpected Pit Bull donates 100 percent of its net proceeds to pit bull rescue, education and advocacy organizations. Since August 2011, customers have been given the additional pleasure of choosing any one of five regional charities to receive the proceeds. Past proceeds funded a shelter expansion project as well as numerous spay and neuter programs, plus pit bull adoption programs. The organization continues to sponsor initiatives that advocate, educate and provide service on behalf of pit bull type dogs. The Unexpected Pit Bull credits their fans and customers with their exponential growth and success. In addition to continuing to be counted on by their partner beneficiaries and affiliates, the organization’s long-term goals are to sponsor innovative programs that focus on training pit bull type dogs for assistance, rescue and therapy dog work, programs that re-introduce pit bull type dogs into the mainstream of public opinion with the highest regard. For a limited time only, RESCUE CHOCOLATE and THE UNEXPECTED PIT BULL are making it oh-so-easy for you to gift your loved ones (or just yourself!) 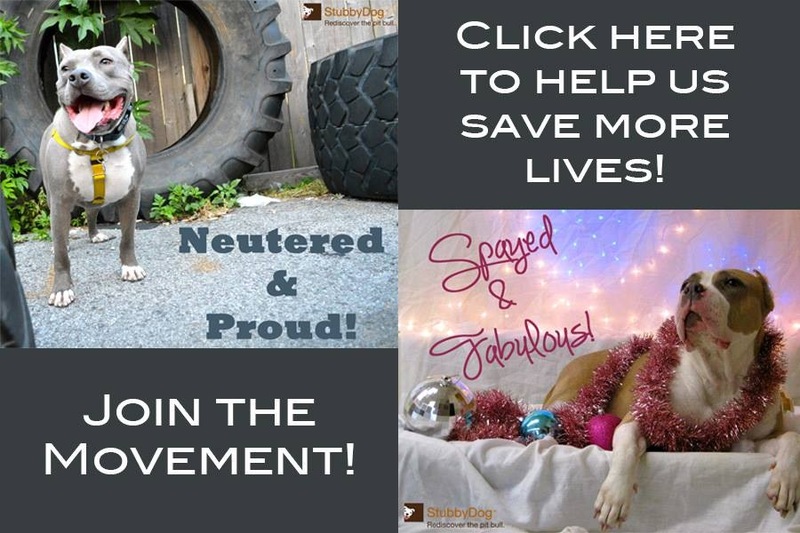 while at the same time donating 100% of your purchase net proceeds to deserving pit bull charities from coast to coast. 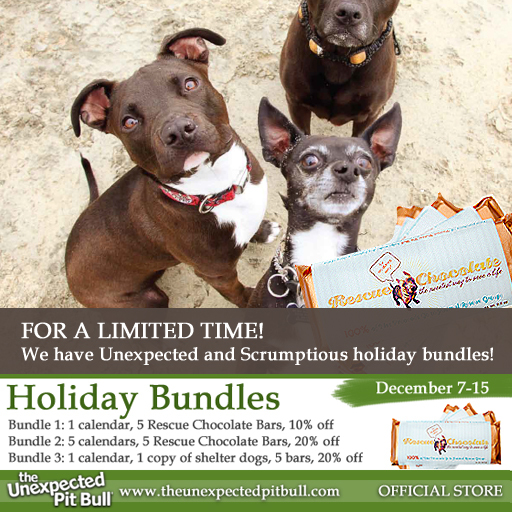 Check out these great holiday gift bundles featuring scrumptious Rescue Chocolate’s Peanut Butter Pit Bull Bars (vegan / dairy free!) and The Unexpected Pit Bull 2012 Calendar gorgeously photographed, lovingly designed, 2012 calendar–created incollaboration with artists-for-animals organization HeARTs Speak. 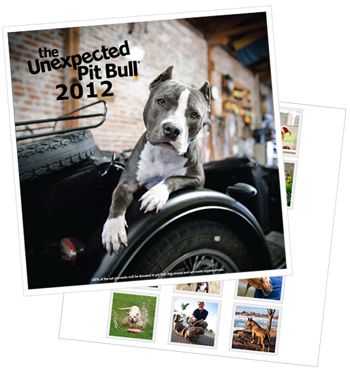 StubbyDog is happy to announce that the first five people to comment with their ‘unexpected pit bull’ moment will receive a free Unexpected Pit Bull 2012 Calendar! We adopted Mocha, an AmStaf mix mutt, in May 2010. She was our first dog as adults and we had our hands full. We don’t know her story before she came to the rescue that we adopted her from. She had some manners, but she was very stubborn and headstrong. Actually, she still is! She loves to play, and she doesn’t always mind us. My neighbor, Nevis, was very ill and in hospice care. Her daughter, Donna, would “borrow” Mocha from time to time just to have something joyful in a house not exactly brimming with excitement. Mocha would cheer up Nevis and Donna every time they saw her. Even in the later stages of dementia, Nevis remembered Mocha. She would ask, “Where is that dog? I miss the dog.” One day we were over visiting and Nevis had her prosthetic leg off because it was bothering her. Mocha, this goofy and hyper dog, went over and crawled up on the footstool and began licking where the prosthetic leg would go. Just a gentle lick like, “I know this isn’t normal. Maybe I can fix it.” I looked over and Donna had tears streaming down her face. Last summer, Donna was ready to get a dog of her own. She was tired of living in the house alone. Her first choice? A beautiful little pit. Why? Because she saw in Mocha that pitties are not monsters. I call “stubborn and headstrong” full of life. I have one too and yours sounds like mine. Mine was crated for too long each day and had too much energy and not enough contact. Extended crating is hard on the rescue dogs. She had what they call hard eyes, maybe it was, “I am stuck in this cage all day” eyes. Now that she is able to get out and have fun and exercise, she has the soft eyes and is trainable but my girl remains full of life like yours is. I wish I could comment with a picture… I have so many of my sons sharing the moment of their life without beautiful pitbull doggies. Our darling Poke’ lives in doggie heaven now, but my younger son had to pose with Poke’ to show off his Chess Club trophy when he was in 3rd grade. They both look so proud! I wish I could comment with a picture… I have so many of my sons sharing the moments of their life with our beautiful pitbull doggies. Our darling Poke’ lives in doggie heaven now, but my younger son had to pose with Poke’ to show off his Chess Club trophy when he was in 3rd grade. They both look so proud! I am ashamed to say that I too was terrified of my neighbors pitbull. “Kilo” is a huge dog, with powerful muscles that made me cringe in fear every time I saw him out. Little did I know I would end up “rescuing” one of his puppies. My little Bella ended up with my parents because of some changes in my living situation, but she has totally turned around the fear I felt towards pitbulls. Her dad “Kilo” ended up being one of the sweetest dogs ever as well, but I would have never known tha, had I not been lured in by Bella. My daughter works for a local Humane Association and lives at home. About 8 months ago, she called and asked me if we could “foster” a pitbull puppy for a few nights while an application was being reviewed for her adoption. Reluctantly, we said yes and to make a long story short, the person never came for her and the longer she stayed, the harder it was for us to say she had to go back. I was a little leery of the breed at first, but after a few short days, grew to know Esther as the funniest, most loving dog I’ve ever known. She never ceases to make us belly-laugh so hard, with her daily antics. We love her like crazy!!! I will admit that I was a little nervous about bringing home the kitten to my pit bull-friendly house. Bodie is almost seven and he’s a nice ‘old man’ but I didn’t know how he would react to something so small.